4,789 km of cycling - as part of a bicycle world trip - from Bangalore southwards across Tamil Nadu, westwards to Kerala at the Indian west coast, northwards along the coast to Goa and to Mumbai, crossing Great Thar Desert to Rajasthan, eastwards via Jaisalmer and Pushkar to Jaipur and Agra with famous Taj Mahal, to Varanasi at the Ganges River and then northwards to the Nepali border. 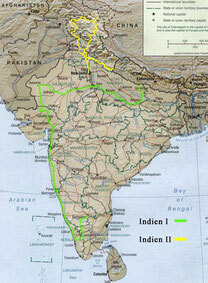 Do you like Cycling India I? Arrival at 1:15 a.m. at night in Bangalore. Half an hour of negotiating the fare for the taxi to bring my bike box and me to the hostel with supposed 24-hour reception. 3:30 a.m. eventually we found the hostel, of course in total darkness and everything closed. I called the 24-hour reception, ages later a sleepy answer and again ages later I finally got access. I fell down on my bed for about 1.50 US dollar per night and finally, finally it was quiet. I had arrived in India! There wouldn't be that much more silence for the rest of my time in India, as well as there wouldn't be anymore temperatures below 30 degrees. Furthermore there wouldn't be any picture anymore taken with my wide angle lens, as it unfortunately decided to take his terminal breath. Since even the recently in Australia newly bought telephoto zoom lens didn't work properly anymore and hence already the third lens didn't survive the bumpy roads on this trip, and as I had been tired of wasting a lot of money for digital SLR lenses, I eventually bought a new compact digi-cam in Bangalore. Furthermore I got myself a meningitis vaccination and four days later I reckoned I got used to the incredible noisy and chaotic traffic, the best food since months and the most times ridiculously low prices, and finally got started. Nevertheless unfortunately I had to say goodbye to Douglas, as he was going to go further east before flying to Sikkim in the Himalayas, but we were hoping to meet up again in Nepal in a couple of weeks. I started cycling westwards, left the State of Tamil Nadu and reached the coast of the Arabian Sea in Kerala, where I turned north. Still 600 km to Goa! In Goa's capital after hours of shopping around I eventually found a new one which apparently didn't seem to be a cheap plagiat. Having spent some lazy days under palms with live music at the beach and the sunlight waking me up in the morning when shining through my bamboo hut, I went on further north. I gave the mainly by package tourists filled up beaches in Colva, Benaulim, Calangute and Baga just a short visit, before finally ending up in Anjuna and Vagator, the places to be! What to say? I went to parties right at the beach and at spectacular open air locations on the cliffs overlooking the sea, I strolled around the famous weekly flea market at Anjuna Beach and together with Vikash and Isaiah from the US I gave Paradiso a visit. Goa's biggest club, the ultimate temple to trance, tumbled down to the beach in several impressive open air dance floors and bar terraces. And, as it had to be, the dance floor still was packed, when the morning sun hit the palms... Oh yeah, no need to say that, I'd be back! A couple of days later I arrived in Bombay (Mumbai) and here my life could have changed. With Dennis from Holland I just strolled through downtown Bombay, when we got casted for a Bollywood movie, with the offer to get paid and food. Shooting would have taken place the whole night in one of the studios of India's huge Hindi language film industry in northern Bombay. But we refused as I got once again a conjuntivitis in one of my eyes and actually Dennis didn't want to as well. Therefore it had been rather the visit to one of Asia's most renowned eye clinics than the missed movie career that could have changed my life. Cause actually I went there to get an examination of my eyes, but I ended up with an appointment for a laser surgery with a laser with new technology, recently bought in Germany, which, for the very first time, would have made a surgery possible for me. All this, of course, for far less then the price in Germany. But after one hour of internet research with the result of terribly frightening stories of people being rather blind than having got any eyesight's improvements, I skipped the appointment and instead got myself a painfully expensive booster of my Japanese encephalitis vaccination. I went for sunset to Chowpatty Beach, gave the more than 5,000 men a visit, who washed thousands of kilograms of Bombay's soiled clothes at Mahalaxmi Dhobi Ghat each day, explored a couple of temples and markets, before heading further north to Rajasthan. The following days were filled with nothing but cycling in incredible heat and, well, let's say as everywhere in India, people staring at me as if I was a little green extraterrestrial creature. The temperatures were rising above 40 degrees before noon, in Great Thar Desert up to 46 degrees in the shade, though I of course never got the chance to cycle in any shade! Therefore the green creature used to stop from time to time at simple restaurants along the road, dropped on one of the chairs underneath a fan anywhere in the shade and ordered an Indian tea or a meal. When the green creature then started to drink the normal drinkable well water, even gallons of it, instead of buying the bottled mineral water like all other green creatures used to do, the crowds surrounding the green creature regularly became even bigger. "Where are you from?" unsurprisingly was mostly the first asked question. Ah, from Germany! This was the country that threw the nuclear bomb on Hiroshima, one proudly presents his historic knowledge with a self-confident smile. The green creature looked quite shocked and tried to figure out how to present a basic history lesson in a way that the Indian history expert wouldn't lose face. In the end the green creature just shook his head, whispered something like "no no, the United States..." and tried to talk about anything different. When finally the green creature's body temperature had decreased to normal 37 degrees and all the other usual questions about number of children, going to where, coming from where, travelling for how long and the price of the bicycle were more or less honestly answered (my personal children record had been seven, which had been obviously appreciated), the green creature started cycling again, after having dipped his shirt in the water to have at least a slight refreshment for the next couple of hundred meters. Eight days later I arrived at breathtaking Jaisalmer in the Great Thar Desert close to the border to Pakistan. Together with a couple of other guys I strolled around in the giant gleaming golden sandstone fort above the city and head for sunset to Sam Sand Dunes outside town in Great Thar Desert. I went on to Jodhpur with its sky-blue old town surrounding a huge fort at the edge of Great Thar Desert. But apart from these magically coloured houses, the old town consisted of the typical and terrible Indian mix of narrow lanes, packed with noisy taxi-rickshaws and motorbikes, cows, awful stink, crowds, dust and rubbish. Furthermore a dubious fruit juice from one of the street stalls knocked me down with stomach cramps for one day. Therefore I was fairly happy when eventually leaving town for heading further east to Pushkar, a tranquil oasis at the edge of Great Thar Desert, with more than 400 temples surrounding a holy lake and with a somehow decent mix of pilgrims and travellers. In Jaipur in eastern Rajasthan I met up again with Isaiah and Vikash, who I had met before in Goa. Together with a dozen of American students, who were studying in town, we went for a birthday dinner of one of them and afterwards shopped around in town to find a still opened club or bar. But eventually we ended up having a couple of drinks in our hotel rooms. Further east in Varanasi at holy Ganges River, I spent hours with strolling around the bathing ghats. In a long string they line the Ganges' bank. I watched the people, who came here mostly from far away, bathing and praying in the holy waters and visited burning ghats where about 250 bodies were cremated in public each day, as it was one's greatest imaginable honour to get offered his own ashes into the Ganges River. But as additionally everything else got discharged into the river as well (the water contained 1.5 million faecal coliform bacteria per 100 ml. In water that was safe for bathing this figure should be less than 500! ), buffaloes got a wash in there and as it simply was heavily polluted, I went without a bath despite the terrible heat. A couple of days later I went a further 100 km to the east, before turning north, heading for the Himalayas! Still 250 km to go to the Nepali border! But on the other hand India had made me deeply lucky and happy, the mostly vegetarian food alone had been worth the challenge to cycle this country, particularly the southern India's food. And there had been the people who make India so unique, when talking and laughing with children or having a quite useless but so amazing conversation with old men without understanding even a simple word. India had been inspiring, frustrating, thrilling and it had made me happy, all at once. I crossed the border to Nepal and was deeply looking forward to mountains, remarkably less traffic, bearable temperatures and, most of all, ... a tiny little bit of silence!